It’s particularly disturbing when products that are supposed to protect you, actually mislead you into a false sense of safety, hence endangering you. Take this bold claim by the otherwise quite good free antivirus software Avast! Here, Avast! 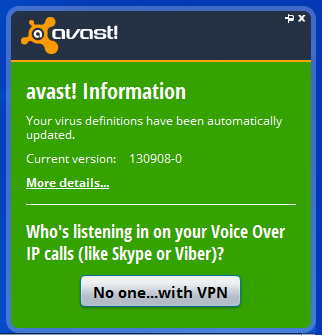 directly claim that nobody can listen in on your Voice over IP (VoIP) calls (like Skype or Viber) if you use the Avast! VPN service. There is absolutely no way of stopping the government from getting the content of your VoIP calls directly from Microsoft (Skype), or Viber themselves. All a VPN (Virtual Private Network) service can achieve is thinly disguise your physical location when you connect to the Internet. This entry was posted in awareness, privacy, propaganda, security, technology and tagged anonymity, Avast, free antivirus software, Tor, Virtual Private Network, VoIP, VPN by namastekirgisis93. Bookmark the permalink.